Steven had years before told when sheep herding gone to a lake that was somewhere betw. (between) Lath'kawk (Grizzly Peak) and Pa'kaytkam (area around Greensprings Mountain), and had seen it steaming. It was a big lake, a sort of poison lake, Molly had told him how all the country was sort of poison here in old times. When he visited it again later on, he was surprised to see it dry. He walked on its hard white saltlike floor. It was dry, and he took a stone and threw it in a sort of spring that the lake had had in it, and all of a sudden the water spurted up, making a bubbling sound. The evening of that day (that he threw rock in lake) he came home, had no appetite for supper, & said he was g. (going) to die. Molly told him it was bad to throw at that water. And next morning he gave up his job and had his household goods hauled to Phoenix ... & in 4 months Steven died. This lake was at foot or on slope of mts. on Tatonth. This plcn. (place name) she says is name of a poison lake that killed Steven, and a few minutes later, says it is name of a very cold spring that comes out in a mt. top somewhere near this lake. 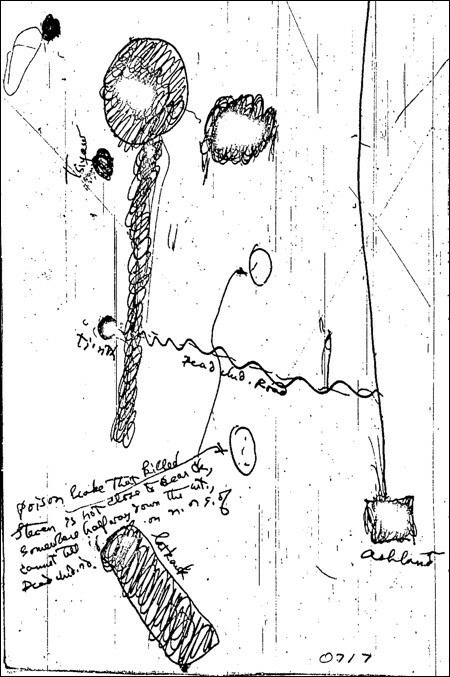 The map is from Harrington's 1933 field notes, showing the location (or two!) 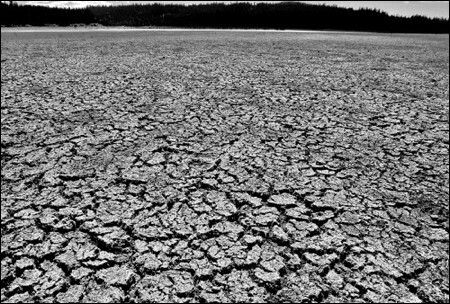 of the lake, and the photo shows a dried-up lakebed in the area where the story takes place.